Quirkier the better – seems to be the mantra of Indian Weddings these days. All the fancy brides out there who are looking to have a pinterest worthy wedding decor are ready to drop a bomb of money. I don’t get it. I know it looks drop dead gorgeous…but that’s not possible for everyone. Correct? Doesn’t mean we don’t want a good looking wedding decor. Its just that it will take some serious amount of personal effort to achieve it. But the end result is going to be amazing. But but but, having said that….I like the easy way too…read CHEAP/FREE ! Its not like brides-to-be have all the time in life to do what essentially a wedding planner and a decorator should do for her…but sometimes, you just have to do it. I have been travelling to Uttarakhand quite a bit ever since the wedding, and given that it is a hilly region…I found one item that was available in abundance just lying around…all over the place..PINES ! It looks so amazing, and when you see it in the wild, you actually tend to appreciate nature’s wonders. But not being able to use them productively is a waste isn’t it? So I started researching, for my own benefit…because me and my hubby picked up a bag full of them…and we didn’t know how or what to do with it. But while I was googling like crazy, I stumbled upon ideas that would work amazingly for wedding decor. You may just find some of these super useful. Take a look. Works perfectly for a themed winter wedding. If your wedding is some time away and you happen to be traveling in the wilderness for some trip….then keep an eye out for pines. Firstly, they are free…and they are gorgeous ! Candles, twigs and pines…what more would you need. Not only is it creative, it also makes for an unusual wedding decor which will set you apart for sure. Which style do you like better? There is honestly not much mehnat (struggle) to do here, and the results are fantastic. You can even check with your decorator if he can do this by getting one of his guys to fix it for you. At the most labor charge will cost 500 bucks…which is also on the higher side, but still…weddings…so lets be a little generous. Another innovative way of decorating the pines…you can either put this up as a center piece, or also in one of the click-worthy sections of your wedding decor. Add a bit of fresh flowers and twigs, some junglee flowers – which should cost you very very less, and you’re good to go ! Mason jars are all the rage nowadays and that makes them a little expensive too…but if you’re up for it…you can add a little glue all over the jar or the lid, and top it up with some glitter to match your wedding theme. #4 On top of the wedding cake ! Super cute isn’t it? If you go all out with a pine themed winter wedding, this is probably the best way to showcase the use of pines. Adorable for sure, it will get you quite a few praises from friends and relatives ! Candles are so so romantic and that’s why they are perfect for weddings. You get such a mushy-mushy feeling because of them, not to forget the aroma that comes from the scented candles. Luckily, you can get big packs of candles which don’t cost all that much…so you can pretty much keep the whole place (electricity free) lit up and still make your wedding look fabulous. 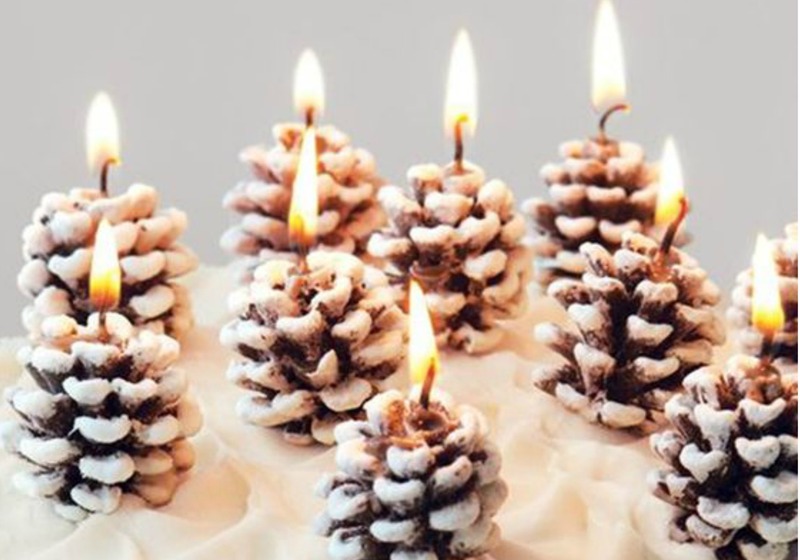 And while you’re at it, use the smaller pines to decorate the candle holder ! Looking for some inspiration to send some love to your bridesmaids your bffs? This is the perfect accessory to team up with a nice card with lovely messages. Just be creative and send across some love. If you don’t want to do a seating arrangement bit, but you love this idea…you can instead leave empty notes in the same manner with a heading of wedding advice, blessings for bride & groom etc. It will be a super cute idea to implement which will cost you practically nothing ! If you have a pine themed winter wedding, then why not go a step ahead and give out decorated pines as wedding favors. It will be quirky for sure, and your guests will leave the wedding with something that totally resembles the wedding theme. If you want to know how to achieve this look, then click on the tutorial right here.